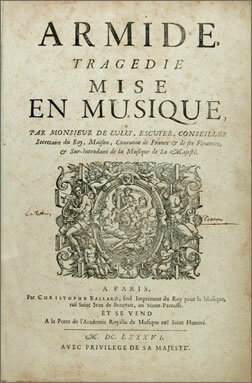 Classical Music can’t be all that dead – or even sick – if you can show a relatively obscure French baroque opera on a freezing cold Sunday afternoon on the inconveniently located outskirts of the District of Columbia and do it to a full house. 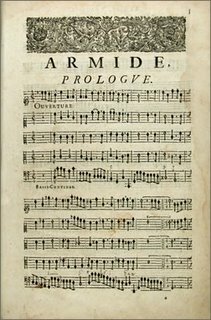 Well over 2000 ears perked to hear Opera Lafayette present Jean-Baptiste Lully’s Armide (on Torquato Tasso's oft set Gerusalemme liberata) under the direction of Ryan Brown. Even if (French) baroque opera can get long (maybe 45 minutes longer than would have been ideal for this otherwise rapt listener) and a tad repetitive, no one will have regretted the long trip to Maryland University’s Clarice Smith Performing Arts Center. Performed in a concert version but with baroque dance interludes (or danced ‘commentary’, so to speak – provided by the New York Baroque Dance Company), excellently played by the period orchestra (the strings a little shallow sounding, if a point of criticism must be found), and splendidly sung by its cast, Armide was as close as the baroque opera world gets to an ‘event’ in this town. The title role was taken by mezzo-soprano Stephanie Houtzeel who calls a fiercely trained, steeled, and concentrated veteran voice her own – a voice that could eat all the others on stage for breakfast… which is not to say that it was more beautiful or pleasant than, for example Ms. Dubrow’s soprano: a rich, full, pleasantly round instrument, well suited to French; a voice that has not yet had its naturalness trained out of it. An unrelated, mild struggle was faintly audible at times, but hardly distracted from her contributions (La Sagesse, Sidonie, Mélisse) which contrasted so nicely with Ms. Houtzeel’s. The latter’s voice filled the barn-like Elsie & Marvin Dekelboum Concert Hall that it would not allow for the church effect that smaller voices were affected with. Veteran singer Ann Monoyios (La Glorie, Phénice, Lucinde) had this natural resonance added to her clear tone. François Loup (Hidarot, Ubalde) is a natural choice for such undertakings as Armide in this region: Like a veteran sweeper in football, he can get the desired results with a fraction of the effort that younger colleagues would have to invest. His (musical) intelligence and experience allow him to sing his parts more marvelously than the voice he still has (impressive in its own right) alone would allow for. Robert Getchell’s Renaud was sturdy and unassailable – all in a role that does not quite offer the same opportunities to sparkle as those of his female colleagues. The same can be said about Tony Boutté’s “Danish Knight” and William Sharp’s Artémidore and his “Hate”, La Haine. The UMD students Darren Perry, Tara McCredie, Adria McCulloch, and Eric Sampson made the most of their small parts as Aronte, a nymph, a shepherdess, and that “fortunate lover”. The dances, based on known patterns of baroque dance and choreographed by artistic director Catherine Turocy were delicate and graceful beyond what one might expect, in earnest ignorance, from prologues, preludes, and interspersed orchestral dances padded with baroque dancing. Elaborate costumes further helped add much appreciated color to this concert-performance which gave much reason to look forward to the upcoming performances of Gluck’s Armide, fully staged, at the Clarice Smith Center’s Kay Theatre in April.